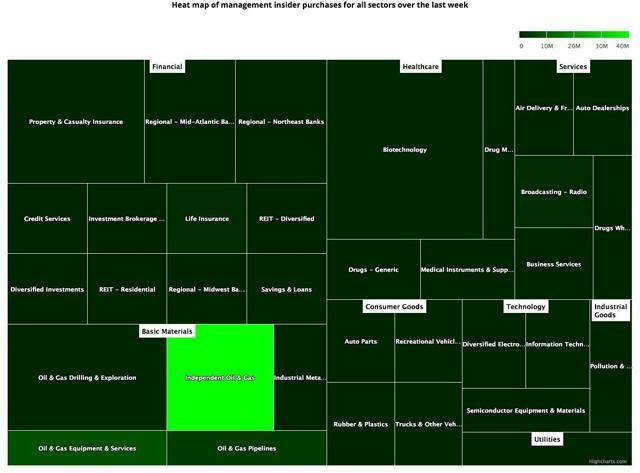 Insider buying increased last week. Notable Insider Buys: Continental Resources, Inc., New Fortress Energy LLC, Kinder Morgan, Inc., Revlon, Inc., and Entercom Communications Corp. Notable Insider Sales: Walmart Inc., Ulta Beauty, Inc., Palo Alto Networks, Inc., RealPage, Inc., and Wayfair Inc.
Insider buying increased last week with insiders purchasing $79.08 million of stock compared to $53.36 million in the week prior. This increase in insider buying was mostly driven by a trio of insider purchases in the energy sector as discussed below. Selling also increased with insiders selling $1.87 billion of stock last week compared to $1.58 billion in the week prior. Note: As mentioned in the first post in this series, certain industries have their preferred metrics such as same-store sales for retailers, funds from operations (FFO) for REITs and revenue per available room (RevPAR) for hotels that provide a better basis for comparison than simple valuation metrics. However metrics like Price/Earnings, Price/Sales and Enterprise Value/EBITDA included below should provide a good starting point for analyzing the majority of stocks. CEO & Chairman Harold Hamm acquired 791,828 shares of this oil & gas company, paying $42.95 per share for a total amount of $34 million. Mr. Hamm increased his direct stake by 30.15% to 3.42 million shares with this purchase. He indirectly owns an additional 283.12 million shares through a family LLC. Harold Hamm suffered a double whammy over the last few years where declining oil prices significantly decreased the value of his holdings in Continental Resources, a company he founded in 1967 at the age of 21, and an expensive divorce with his wife of 26 years that required him to pay just under $1 billion as detailed in this Forbes article. As you can see here, he made several insider purchases of CLR over the years but this is his largest purchase since we started tracking insider data in 2010. Chief Executive Officer Wesley R. Edens acquired 778,199 shares, paying $10.19 per share for a total amount of $7.93 million. Mr. Edens increased his stake by 31.13% to 3,278,199 shares with this purchase. Director Randal A. Nardone acquired 580,000 shares, paying $9.85 per share for a total amount of $5.71 million. Mr. Nardone increased his stake by 23.20% to 3,080,000 shares with this purchase. Director Matthew Wilkinson acquired 12,500 shares, paying $9.97 per share for a total amount of $124,625. Mr. Wilkinson increased his stake by 17.50% to 83,929 shares with this purchase. NFE is a subsidiary of the private equity firm Fortress Investment Group and went public two months ago at a price of $14/share. The company is in the business of purchasing, liquefying and exporting natural gas. Executive Chairman Richard D. Kinder acquired 219,100 shares of this oil & gas pipelines company, paying $19.74 per share for a total amount of $4.33 million. Mr. Kinder increased his stake by 0.09% to 238,719,493 shares with this purchase. Director Ronald O. Perelman acquired 150,000 shares of this beauty care products company, paying $21.26 per share for a total amount of $3.19 million. These shares were purchased indirectly by MacAndrews & Forbes Incorporated. Chairman Emeritus Joseph M. Field acquired 264,257 shares of this radio broadcasting company, paying $5.48 per share for a total amount of $1.45 million. These shares were purchased indirectly by Mr. Field's spouse and a trust. Director Robson S. Walton sold 5,712,166 shares for $97.97, generating $559.65 million from the sale. Senior Vice President David Chojnowski sold 2,000 shares for $97.17, generating $194,334 from the sale. Director Charles Heilbronn sold 204,990 shares for $335.32, generating $68.74 million from the sale. These shares were sold indirectly by Mousse Partners Limited. Director Robert F. DiRomualdo sold 66,902 shares for $338.69, generating $22.66 million from the sale. These shares were sold indirectly by Naples Ventures LLC. Director Dennis K. Eck sold 46,100 shares for $339.09, generating $15.63 million from the sale. Chief Merchandising and Marketing Officer David C. Kimbell sold 15,452 shares for $333.50, generating $5.15 million from the sale. These shares were sold as a result of exercising options immediately prior to the sale. Director Catherine Ann Halligan sold 100 shares for $344.36, generating $34,436 from the sale. Director James J. Goetz sold 160,000 shares for $242.70, generating $38.83 million from the sale. Director Mark D. McLaughlin sold 6,200 shares for $250.04, generating $1.55 million from the sale. These shares were sold as a result of exercising options immediately prior to the sale. Chairman President & CEO Stephen T. Winn sold 200,000 shares of this software application company for $60.80, generating $12.16 million from the sale. These shares were sold indirectly by Seren Capital Management L.L.C. Chief Executive Officer Niraj Shah sold 31,000 shares for $161.44, generating $5 million from the sale. Co-Founder Steven Conine sold 31,000 shares for $161.42, generating $5 million from the sale. Chief Product/Marketing Edmond Macri sold 500 shares for $159.39, generating $79,696 from the sale. These shares were sold indirectly by a trust. Disclosure: I am/we are long ETM. I wrote this article myself, and it expresses my own opinions. I am not receiving compensation for it. I have no business relationship with any company whose stock is mentioned in this article. Additional disclosure: Disclaimer: I hold a long position in Entercom Communications. Please do your own due diligence before buying or selling any securities mentioned in this article. We do not warrant the completeness or accuracy of the content or data provided in this article.